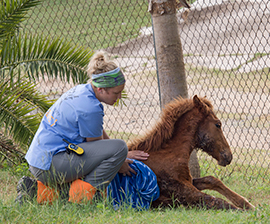 Kali Pereira of The HSUS comforts an injured foal who’d been attacked by stray dogs while wandering the island. Photo by Meredith Lee/The HSUS. Kali Pereira, MS in Animals and Public Policy alumna from the class of 2015, is featured in this article. 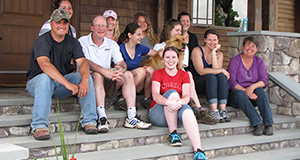 She is with a team from The Humane Society of the United States (HSUS) and Humane Society International on the island of Vieques, Puerto Rico. “They’ve come at the request of the island’s mayor, invited after word spread about their animal welfare efforts on the main island of Puerto Rico. …the organization is partnering with the municipality to increase the health and welfare of all the island’s animals, with a particular focus on its horses. 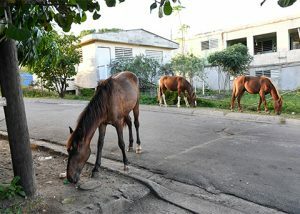 In search of food and water, free-roaming horses in on the island of Vieques in Puerto Rico often put themselves in harm’s way. Photo by Meredith Lee/For The HSUS.